We all know the game, we've all engaged in it as a cure for boredom. So here goes. Feel free to post your own as well. Would you rather have the Gazelle or the Mercier? You know the Gazelle is a Champion Mondial but the Mercier is a mystery. Both are full 531, but the Mercier would cost you a hundred bucks less. Mercier with an upgrade to period correct shifting and levers. Maybe a crank or at least a chain ring upgrade as well. It is more C&V in my eye. I'd probably go for the Mercier. Of course it may have French dimensions and threads, if that matters to you. Is that one all original? I doubt it. And who slammed the stem down so hard? Brifters and DT shifters, now there is something new. The Mercier without the brifters and rat's nest of cables. 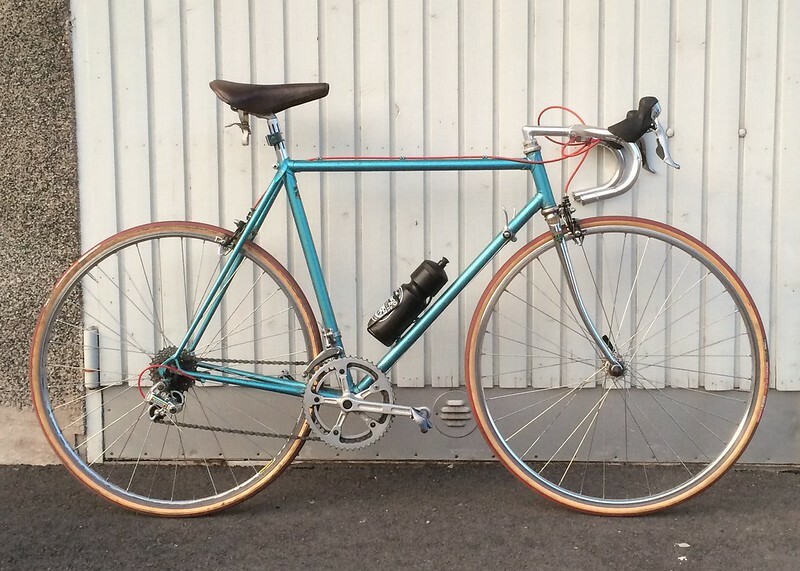 That Mercier is easy on the eyes; the Gazelle isn't. The DT shifters appear to be the ones connected. I can't seem to follow all the wires from the brifters though. Bar tape???? If the brifters are in good shape, they'd be great for a project. I'm a bit late with the aero brakes, but I am liking them, so a few upgrades are good. I do like the moderate V style rims on the Gazelle, and I'm not adverse to a few upgrades. Looks like rear housing might be a little short. Tough choice, but I think I'd take the Gazelle. I have a thing for red white and blue bikes, though. Would be nice to grab the bars and stem offa the mercier and put 'em on the Gazelle. Mercier (then I'd sell the brifters to fund proper brake levers, tape, different housing, and other necessary consumables). What kind of saddle on the Mercier? Sell both, get a dream bike. The Gazelle with the Dutch flag paint scheme is more visually appealing to me. Neither would fit me, so it's a moot point. Oh, come on. I believe ScarJo's older than my Merckx; which is my current favorite vintage ride. Jayne Mansfield on the other hand, I think is actually dead. I'd go for the Mercier, but only because I like the color much better. It's an easy choice for me since I dislike fade paint, white saddles, modern cranks, brifters and deep vee wheels.